It's good to take backup of all your media files and data in your Android phone so that you can use them later again, any time. Consider a typical scenario in which you accidentally reset your phone's settings and deleted everything by mistake. It would be the worst day of your life, especially when you have lost some extremely important files. A backup is always better than when you are left empty hands. In my previous tutorial, I have already discussed about how to backup Android apps quickly. There we have used a third-party app, Super Backup. If you are also planning to reset your phone's data, you may be worrying about the contacts, SMS and call log details. Good thing is that, you can also backup these things in your Android phone and this is what we are going to discuss here. 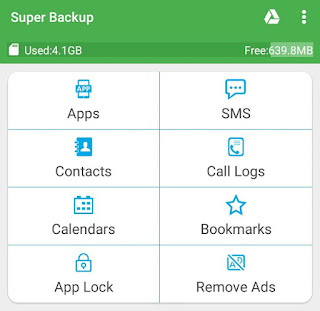 Super Backup, as name itself suggests, is an app which can backup almost everything in your Android phone such as installed apps, contacts, calendar, call logs, SMS and even bookmarks. It is one of the best and efficient app I have ever used to backup my data. You can install this app from Google Play Store, and it's absolutely free. There is another pro version available which is ads free but it doesn't contain any additional features, so there is no need to use it. First launch the Super Backup app. Next, tap the "Backup" button. Now enter a name for the file and click OK button. 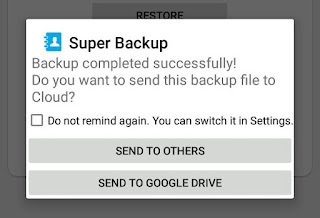 Once backup is finished, you will see a message box as shown in below picture. Again click OK button to continue. 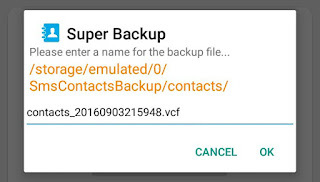 You can also upload the backup file to any Cloud storage such as Google Drive or send it to another phone over Bluetooth, Android Beam or Wi-Fi direct feature. Now in case if you want to restore all the contacts again, first open Super Backup app and then click "Contacts" option. Then tap the "Restore" button and select the backup file. That's it. 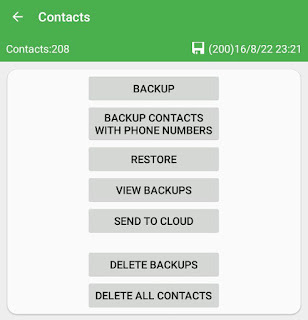 Furthermore, you can view the backup contacts, delete them or delete all contacts saved in your phone. 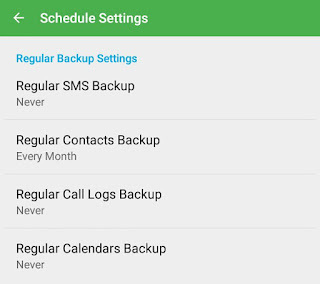 To backup SMS in your Android phone, again open Super Backup app and click "SMS" option. Now tap the "Backup" button and then enter a name for the file. Finally hit OK button and that's it. From the same page, you can view backup SMS, restore them or send a file to the cloud storage. 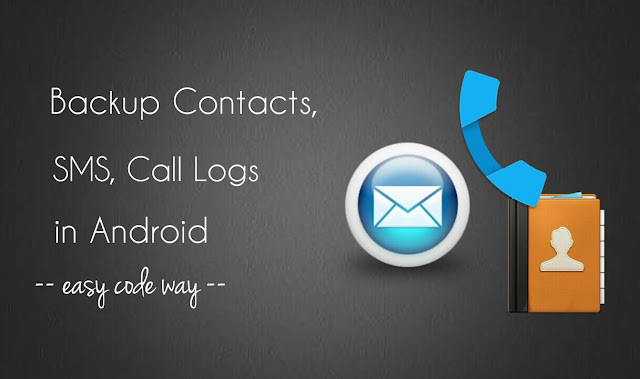 In the same way, you can backup your call logs which includes phone number, name, date, time, duration and other details. Note that, all backup files are in .xml format and they are saved in your phone's internal memory under "SmsContactsBackup" folder by default. If you're planning to reset your phone, first move them to external storage such as in memory card or pen drive. First open Super Backup app and click the menu button (three dots). Now go to "Settings > Schedule settings". Next, click the backup option (say contacts) and then select the time period as per your own choice. You can also enable auto-upload settings to your Google Drive and Gmail account. 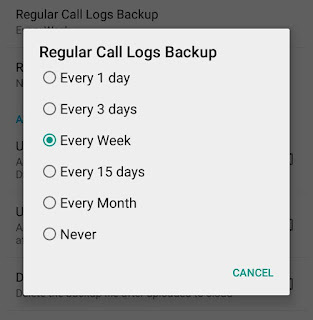 So this is how you can schedule backup of contacts, SMS and call logs in your Android phone quickly. If you have any questions, please share them in the below comment box.